Beautiful baby boy Ziad Kadic is making headlines after entering the world weighing almost six kilograms in Perth. 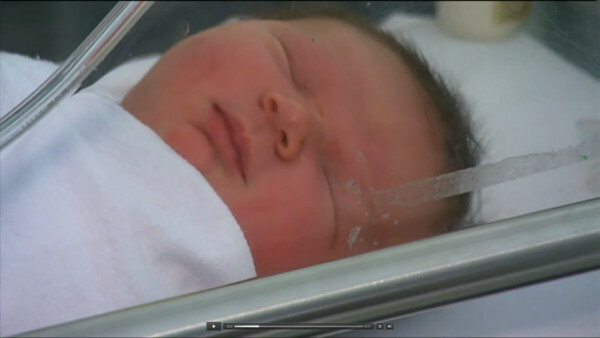 It is believed Ziad is one of the biggest babies ever born in Australia and he’s certainly a record breaker for the Joondalup Health Campus in Perth’s northern suburbs where he was born on Saturday, clocking in at a hefty 13.2 pounds, or 5.987kg. First-time mother Breanna Sykes delivered Ziad by caesarean section as doctors feared her pelvis could break if she tried for a natural birth. “They said he’s just not going to fit. If I try to push the baby, it could break my pelvis. So I had to get a caesarean unfortunately. But he’s here safe and happy and that’s all that matters,” Ms Skykes told Nine News. It is thought Ziad could be the biggest baby ever born in Perth but this is yet to be confirmed.